I returned to the Officina de la Bicicleta Friday afternoon to ask a few more questions. Mr. Ruscalleda was incredibly generous with his time and very patient as I struggled with my Spanish verb conjugations. The nouns and adjectives don’t seem to be a problem for me, but Spanish verbs are tough. Fourteen tenses! Really!? Anyway, all those years of studying Spanish seemed to finally come in handy. Here’s an overview of a few of the infrastructure and policy-related topics we covered. Motorized traffic in Barcelona is heavily concentrated to several main roads that crisscross the city. 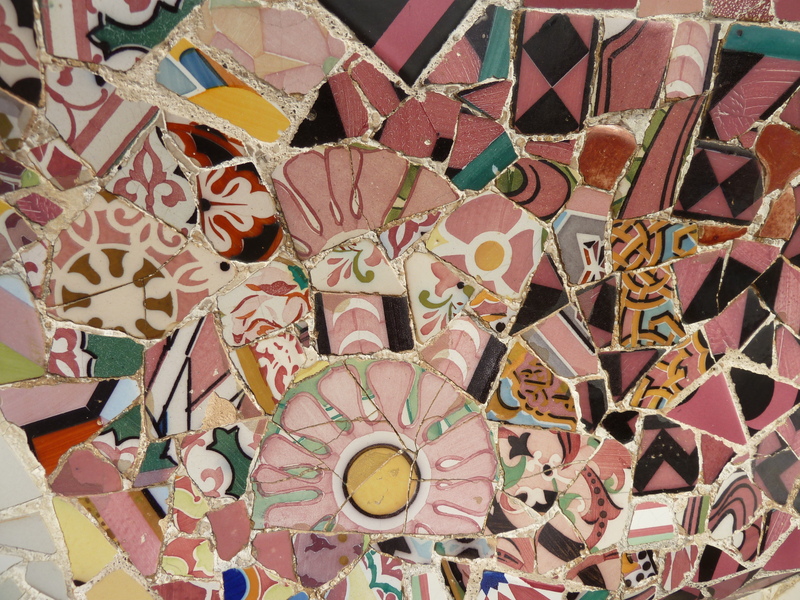 Approximately 30 percent of the streets in Barcelona absorb 70 percent of the car traffic. It’s important for cars to be able to move around a city efficiently and it makes sense to have roads that are primarily for cars, like highways and multi-lane streets with fast speed limits. And, it’s even possible to have bike lanes parallel to these faster moving arterials—it’s just important to have effective physical separation between cars and bikes in these places. Jan Gehl has talked about how bike paths in the United States are like rivers. They are located in pretty places and they often don’t help bikers get to practical places quickly because they wind along lakes and curve through forests. Bike paths in the US are wonderful, but a lot of them are for recreation. Gehl advises that we start building more bike paths in our cities that are like irrigation canals. In other words, we need to start thinking strategically about how we can quickly and efficiently get a high volume of bikers from point A to point B, just like we do with cars. The environmental benefits of cycling don’t actually motivate very many people to get on their bikes and neither does the long-term promise of better health. Convenience is what gets people on their bikes and keeps them on their bikes. I’ve heard this in every single city I’ve been to on this trip. People begin to use cycling as a form of transportation when they realize that it is faster, more convenient, or cheaper than other forms of transportation. I remember back in Seattle waiting desperately, evening after evening, for the #2 Metro bus on the corner of 4th and Spring. It was almost never on time. I’ve probably spent days of my life standing on that street corner waiting for the bus. When the bus finally did arrive traffic was often so backed up from the I-90 line-up that the bus would sit through four or five traffic light signals. Then the bus stopped every two blocks. People didn’t always have the right change when they were getting off or they’d ask the bus driver where they could transfer to the #48 or the #7, further delaying the bus. Sometimes it would take me over 45 minutes to get home from work—and I lived less than 4 miles from my office. I spent so much time on the bus that I started to become weirdly obsessed with the cast of characters who I shared my commute with; my brother suggested that I start a blog called “The #2.” A lot of my stories at family dinner started with, “So, I was on the #2 and…” Seriously, there was a guy who brought his cat on the bus. Anyway, back to Barcelona. I thought about my own decision to start biking because Mr. Ruscalleda told me several times that biking needs to become competitive with driving in terms of ease of use and convenience. 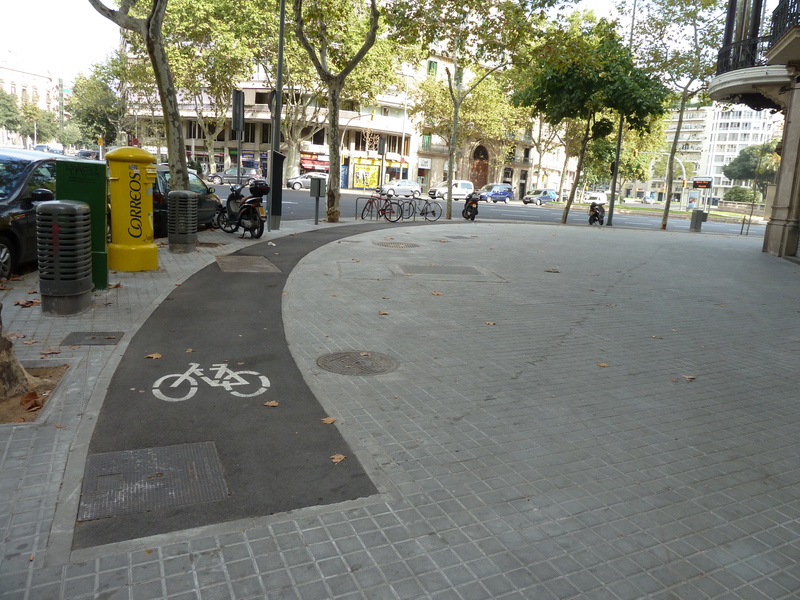 When Barcelona first started building bike infrastructure they made the mistake of converting pedestrian spaces into bike lanes. My bike shop friend, Camillo, complained about this. “Take space away from the cars, not the pedestrians!” he said. Bike lane on the sidewalk. No one really uses these lanes. Pedestrians and bikers don’t mix well. Pedestrians aren’t used to walking in lanes the way drivers are and pedestrians rarely look down at painted lines on the sidewalk. Bikers can use their bells to try to get pedestrians out of these sidewalk bike lanes, but usually pedestrians are just confused and don’t realize they are in a bike lane. Sometimes pedestrians walk in these bike lanes. This is on the Av. de la Diagonal pedestrian mall. Still, this is a nice place to bike if it isn't too crowded. This is especially the case if the sidewalk is crowded and Barcelona has very crowded sidewalks. 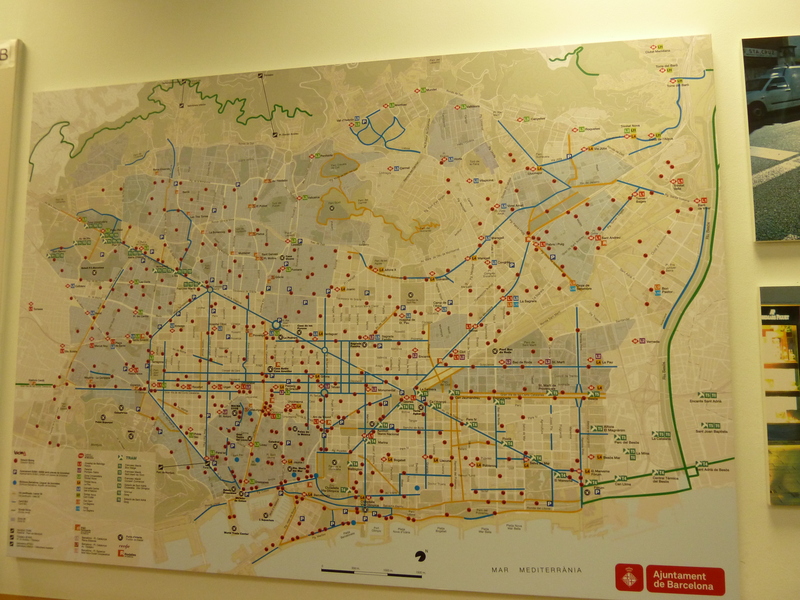 Close to half of all internal trips (trips that start and end within the Barcelona city limits) are on foot. 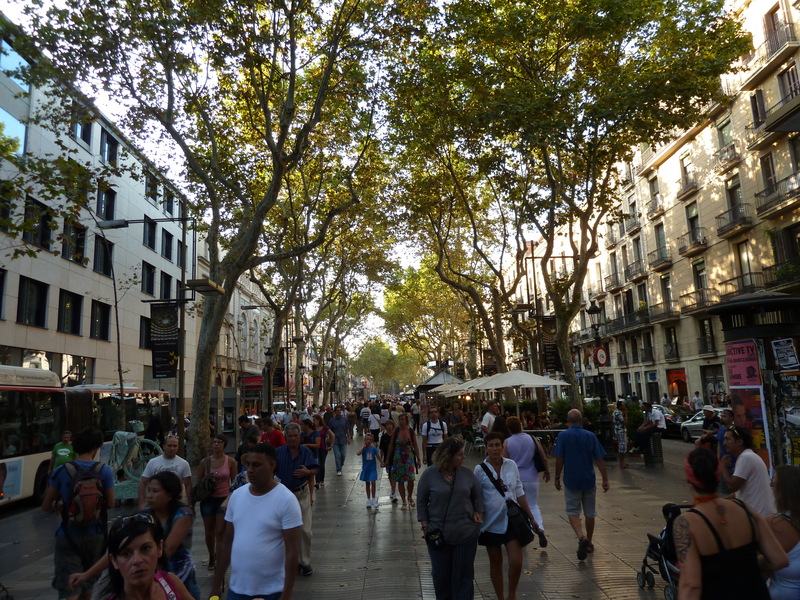 There are over 3,000 pedestrians that walk down this 1.5 km pedestrian mall--called La Rambla--each hour. There are no cycle lanes on la Rambla. 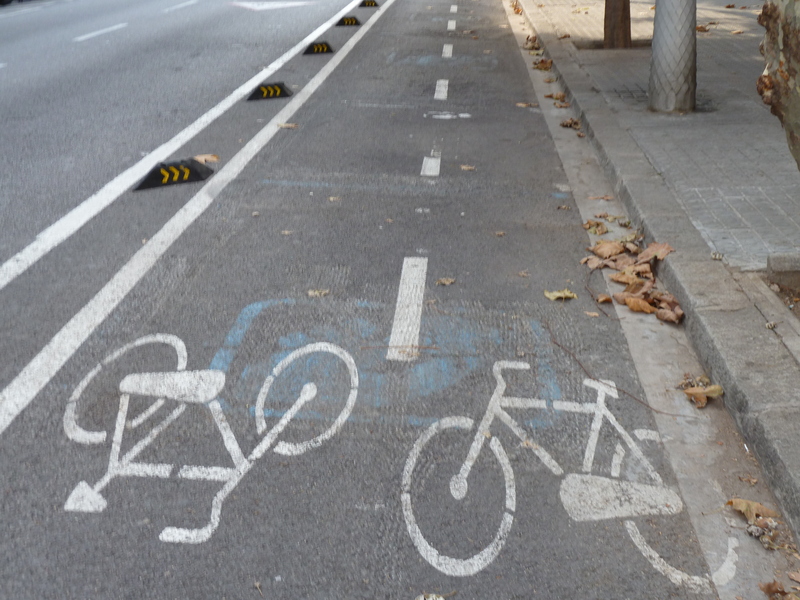 Barcelona is phasing out the bike lanes that are on sidewalks and instead begin to invest solely in separated bike lanes so that cyclists can move about the city faster. 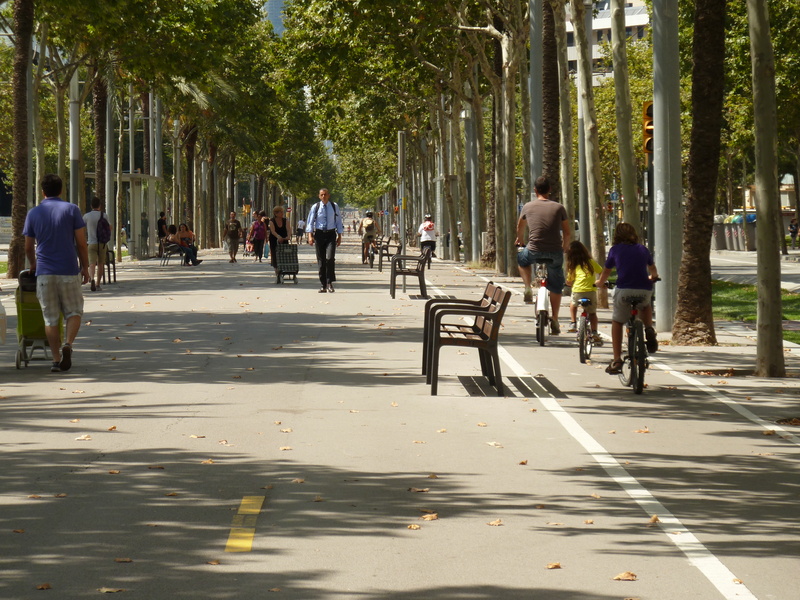 The new separated bike lanes serve as “bicyclist irrigation” and are increasing the convenience factor of biking in Barcelona. Separation, as I’ve said before, allows each transportation mode to move at a faster pace, but if separation is done poorly it can create dangerous situations. The closest I’ve come to having a serious fall on this trip was in Paris in a separated bike lane. The bike lane had concrete curbs on either side to protect bikers from cars, however pedestrians could still easily walk over the curbs into the bike lane. I felt a sense of security in the bike lane and so I was moving pretty quickly—until a cute little old lady stepped into the bike lane right in front of me. I was trapped by the concrete curbs and so all I could do was brake as hard as possible. Paris bike lane with no exit plan. 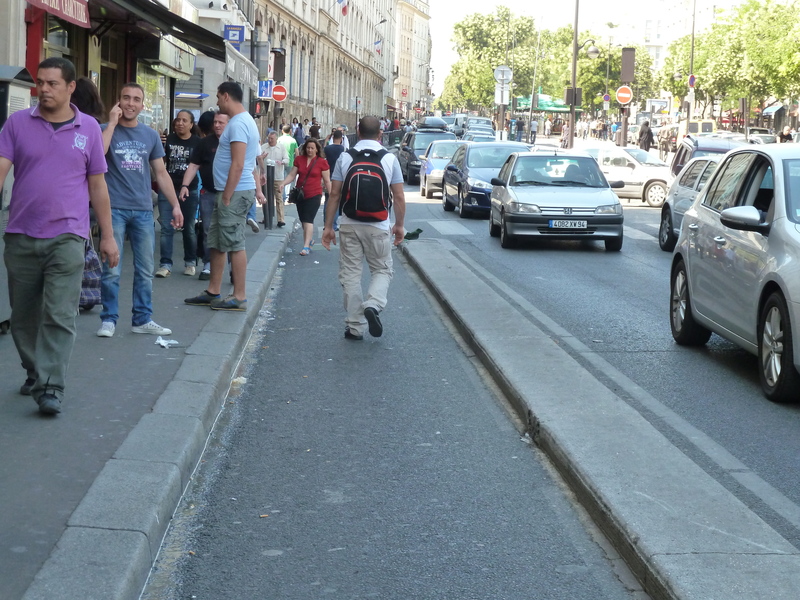 This Paris bike lane protects bikers from cars but not pedestrians. The ground was wet and there was a layer of mushy leaves on the ground. My back wheel skidded, but somehow I didn’t fall. If I hadn’t stopped in time I could have really hurt the old lady and I was also lucky I didn’t fall. Pedestrians in Holland and Denmark know to look both ways when they cross a bicycle lane, but the rest of Europe is still learning about bike lane safety. 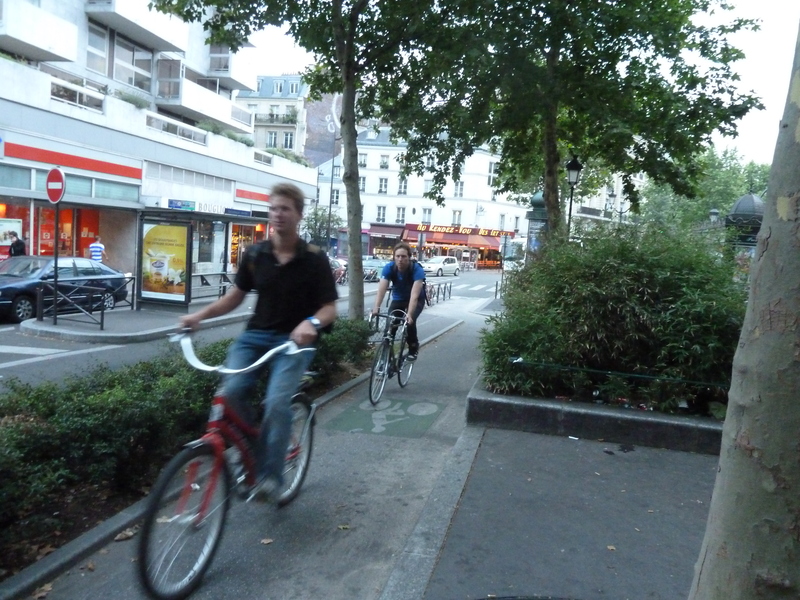 This experience in Paris made me especially happy to see segregated bike lanes in Barcelona that were effective at keeping cars out of the lanes, but also provided exits for cyclists in case pedestrians walked into the bike lanes. 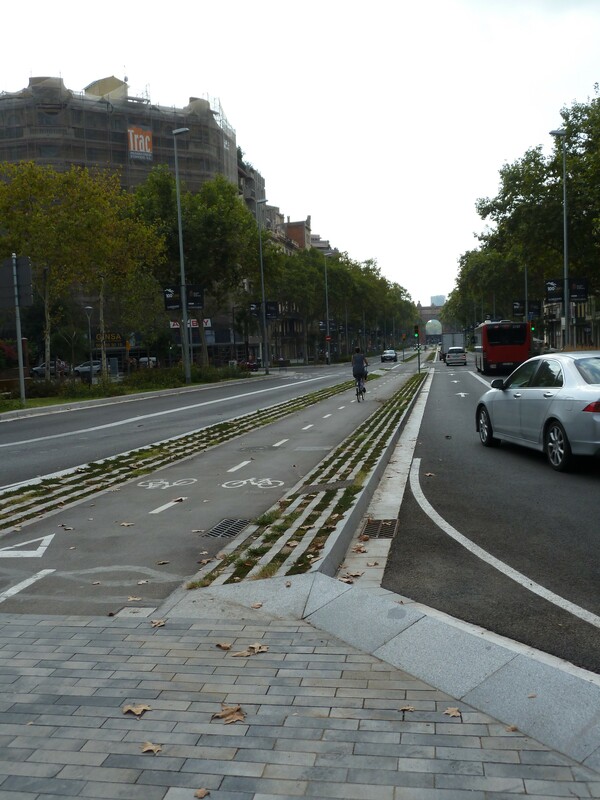 A lot of Barcelona bike lanes offer separation but still give bikers the option to move into the street if they need to. It's not perfect, but better than the concrete curbs of Paris. 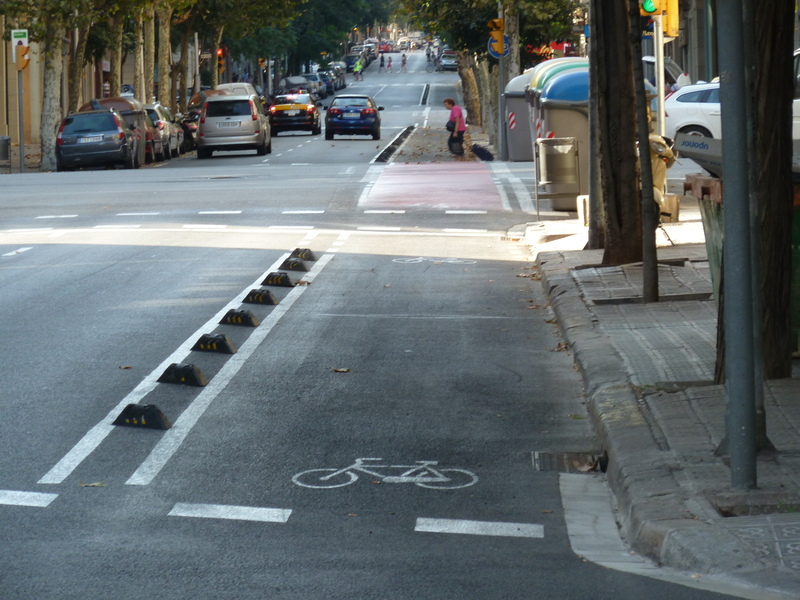 When Barcelona first started installing these plastic separators they’d often get destroyed when large trucks ran over them. They tested out a few different models from several manufactures and eventually found a separator that is very durable. I haven’t seen this kind of separation anywhere else in Europe, but it seems like a really effective and affordable way to build separated bike lanes. Barcelona doesn’t have, or need, bike lanes all over the city because they are aggressively reducing the speed limit in many areas to 30 km/hr (19 mph). Large swathes of the city have already been converted to 30 km/hr zones (called “Zona 30”) and the goal is for more than half the city to become converted to Zona 30. Traffic calming creates a safer environment for bikers and pedestrians and also makes driving slightly more inconvenient, thus making cycling a slightly more attractive option. 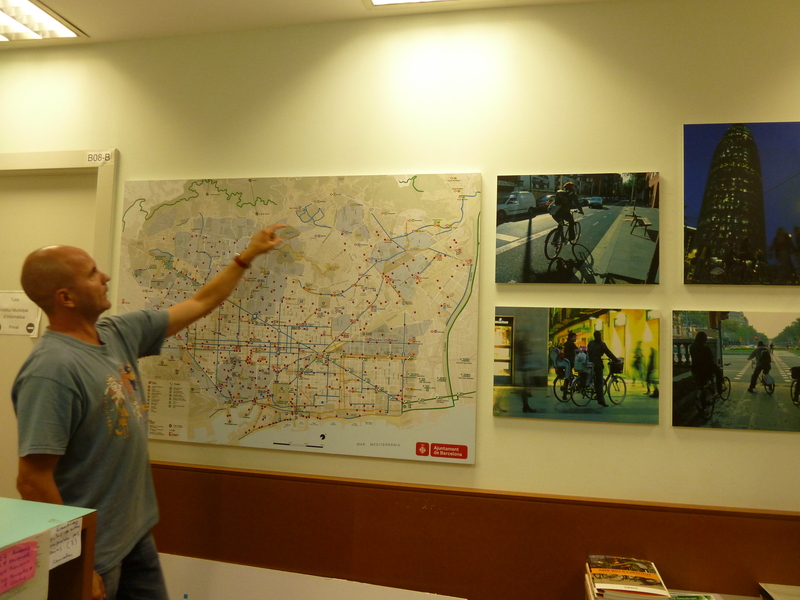 Mr. Ruscalleda and a map of the city's bike lane network and the Zona 30 areas. The areas shaded in blue have already been converted to Zona 30. The city has also added almost 17,000 new parking spaces for bikes since 2005. 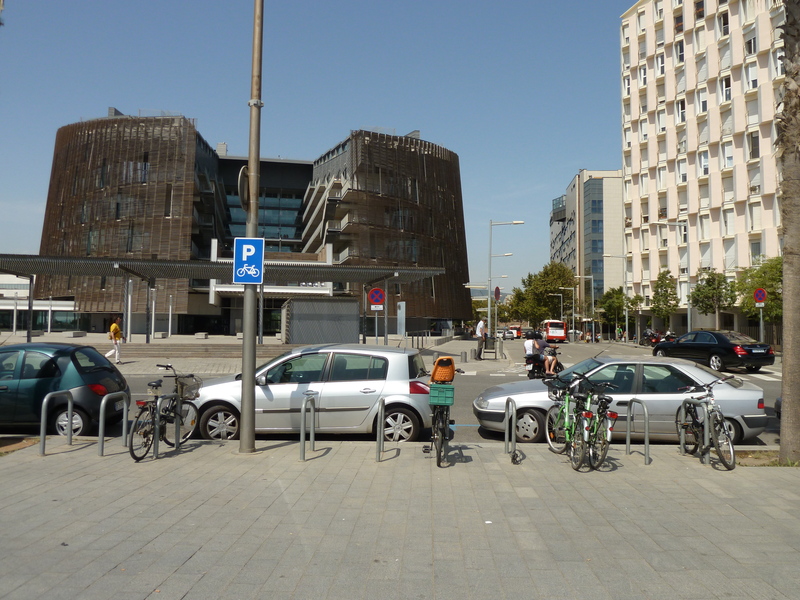 They’ve focused on adding bike racks near public transport facilities, universities, and main employment centers. Residents can also call and request a bike rack for their street. The uniform blue bike parking signs make it easy to locate a place to lock your bike up. One last thing Mr. Ruscalleda and I discussed was “la cultura de la calle” or the street culture of Mediterranean cities. 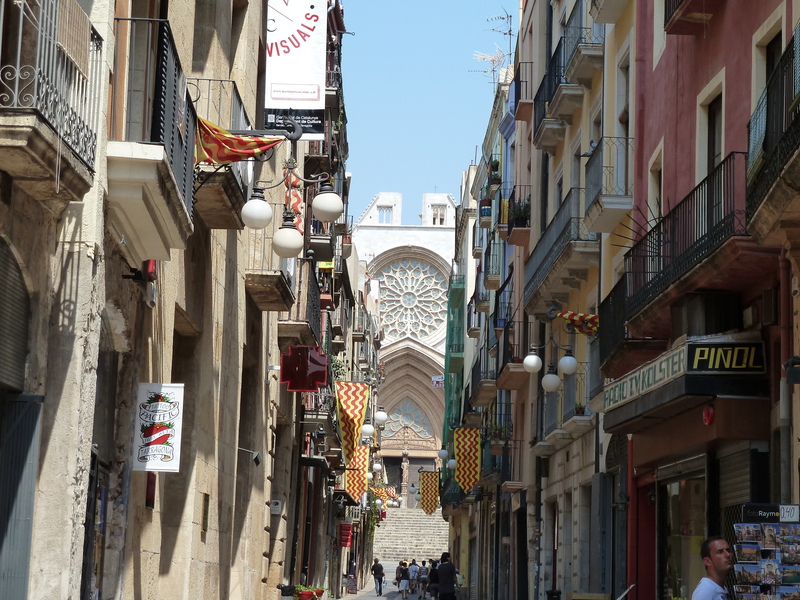 Streets in Barcelona are used for travel, play, dining, commerce, and socializing. Life is lived on the streets and people like street life. Restaurants in Barcelona charge extra if you choose to sit at the outdoor tables facing the street because they know how much customers enjoy watching life go by on the street. The “cultura de la calle” has been a part of the culture in Barcelona for a long time and residents of Barcelona are already very comfortable with streets having multiple uses. The rest of my time in Barcelona was enjoyable. 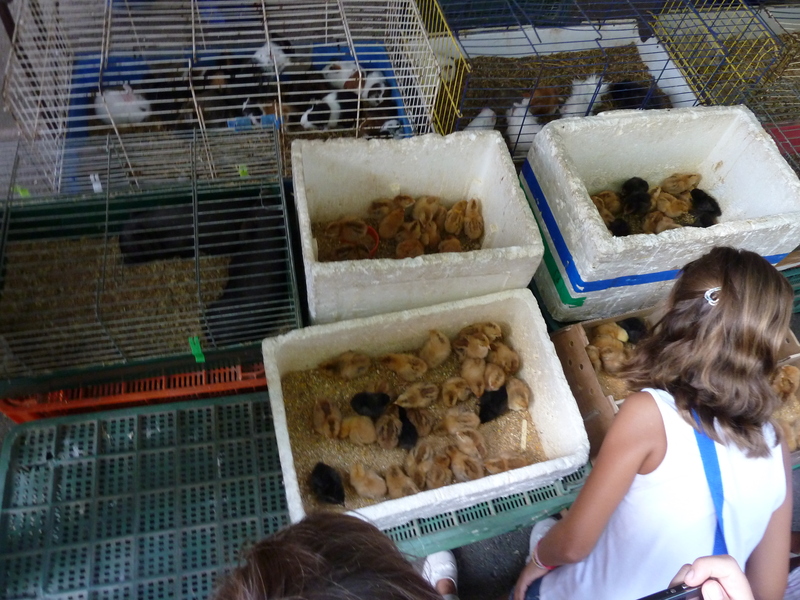 My shorts tan faded considerably, I ate a lot of Andalucían gazpacho and paella, and I met a lot of other travelers from all over the world. Barcelona also beat Real Madrid while I was in town; watching the game in a bar with the locals was a pretty fun experience! 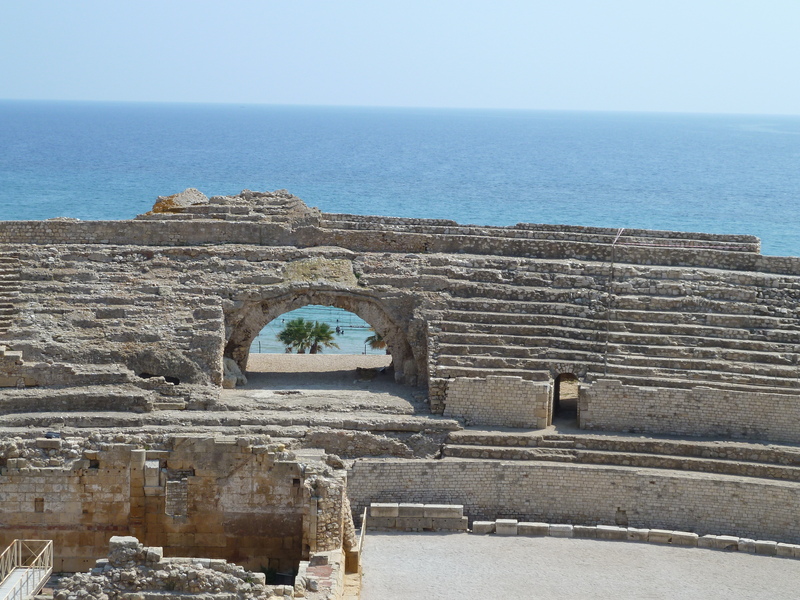 Some of the oldest Roman ruins outside of Italy are just a few hours south of Barcelona in the town of Tarragona. 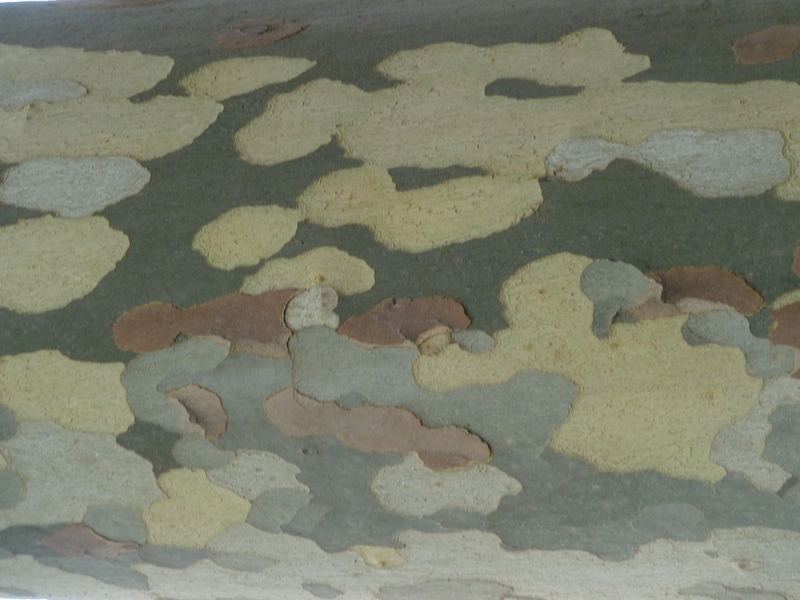 Cool bark--not sure what kind of tree this is though. 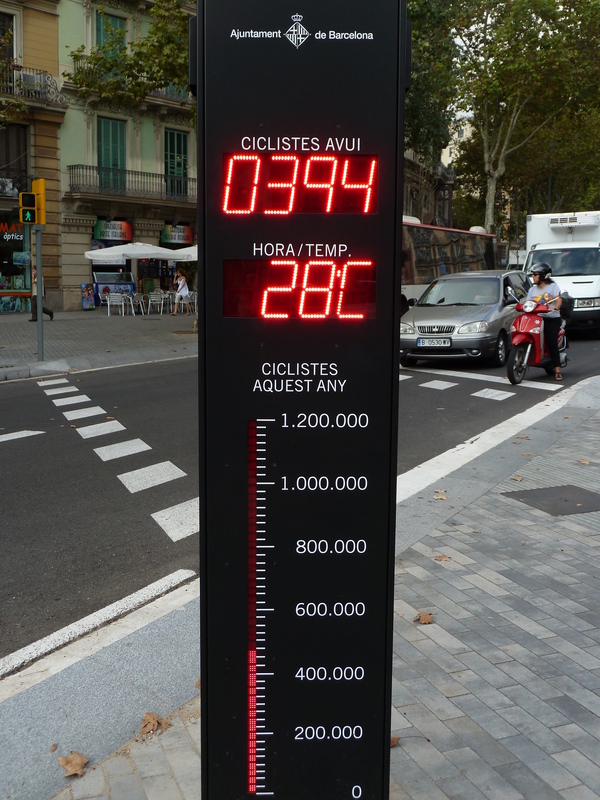 Barcelona's first (and only) bike counter!